Asian American theatre artists by the score (almost!) in Seattle get their due from the Gypsy Awards, recognition in theatre excellence from Seattle’s reviewers and critics (Really. Had to take off both my shoes to count). Ranging from small theatres to big, from institutions to designers to writers to actors to directors, these nominations are concrete evidence of the influence of Seattle Asian American theatre artists. Spanning 28 theater companies and 59 productions, from the largest and most prominent to small, humble and innovative, the Gypsy Rose Lee Awards honor as much professional theater as we reviewers can cram into our year. Well known large companies such as Seattle Repertory Theatre with 6 nominations and ACT Theatre with 15 nominations and Seattle Shakespeare Company with 8 nominations contrast favorably with small companies such as Sound Theatre Company with 14 nominations, ArtsWest with 14 nominations and Theatre22 with 13 nominations. Musical theater companies The 5th Avenue Theatre and Village Theatre inevitably share 15 and 12 nominations a piece as the top musical providers in our area. Seattle Theater Writers, Seattle’s only critics’ circle, presents the 6th annual Gypsy Rose Lee Awards, theater awards devoted to recognizing excellence across the economic spectrum of professional Seattle theaters. Our aim in developing the awards is to entice the general public to consider seeing excellent theatrical events at myriad venues they may never have entered before! Miryam Gordon, head writer-wrangler, says, “We know that human nature seems to love awards and we hope to draw more people to pay attention to (and perhaps even attend) an art form that we love. We also feel that a blended opinion, especially from people who often do not agree, is perhaps a more powerful opinion. If we agree on excellence, we think it means more than any one opinion alone. The winners will be announced January 27, 2017. Founded in 2010 by Miryam Gordon and comprised of local writers and reviewers, Seattle Theater Writers is a group of critic/reviewers dedicated to raising public awareness of theater practitioners and the work produced by professional theater organizations. Seattle Theater Writers’ hope is that these awards might encourage theater attendance and enjoyment of our rich cultural offerings. 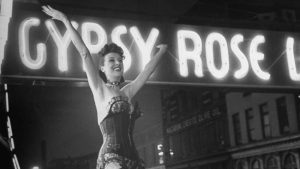 Born from this mission are the annual Gypsy Rose Lee Awards, recognizing excellence in Seattle theater across 33 categories. The participants in this year’s award process were Candace Brown (goodlifenw.blogspot.com), Miryam Gordon (Seattle Gay News and miryamstheatermusings.blogspot.com), David-Edward Hughes (www.talkinbroadway.com/page/regional/seattle/se727.html), Rosemary Jones (www.seattletheateranddance.com/), Dusty Somers (guest writer for Seattle Times), Michael Strangeways (www.seattlegayscene.com/), and Nancy Worssam (artsstage-seattlerage.com/). For more information, go to www.facebook.com/SeattleTheaterWriters. The Notes section of the Facebook page shows the evolution of the awards. I would like to note that Rachel Guyer-Mafune, nominated in the category of Excellence in Performance of a Play as a Supporting Actor (Female): – Puny Humans (Annex Theatre), is of Japanese American descent. Correcting this would be much appreciated.